download the Jenike Independent Report Early storage silos, primarily used by farmers for the bulk storage of corn, were built using wood, brick, stone, or galvanized steel throughout the late 19th century. The use of concrete for the construction of storage silos revolutionized the industry in the early 20th century and expanded the use of storage silos beyond the farm. Today, both steel and concrete silos are commonly used in industry for the storage of ash, coal, lime, aggregate and more. While often less expensive upfront, steel silos have inherent limitations and pose a number of safety risks. Steel silos are susceptible to internal and external corrosion from abrasive storage materials and moisture. They require frequent maintenance and expensive painting. Improper design can often lead to substantial problems and increased safety risks. The factory made metal components come together quickly, but careless detailing of metal walls can leave inward facing ledges or welds that obstruct flow, increase wall pressure and lead to splitting or bursting of metal silos. Bolted connections are also likely to leak fine powders. In addition to these safety risks, the increased flexibility of steel silos enables easy bending or collapse from strong winds. Steel silos are more vulnerable to weather conditions like rain, humidity and high winds. To reduce the risk of high winds, topography can sometimes be taken into account for the design of steel silos. Understanding when hillsides produce a sheltering effect or leave silos exposed to high winds can help reduce some risk steel silos face in high winds. [i]However, even with proper planning, large storms with severe winds are inevitable. In fact, the number of steel silo failures due to wind continues to rise. The first part of 2016 held numerous examples of the dangers posed by steel silos. High winds have led to several damaged or destroyed silos across the country. Severe storms in Frisco, Texas on March 8, 2016 downed one steel silo and weakened another. Both silos were deemed structurally unsound after the destruction and required removal and replacement. [ii] A farmer in Hardin County, Ohio faced close to $1 million in damages when several grain storage bins were destroyed in a heavy wind storm on March 27, 2016. [iii] Wind damage is not limited to older steel silos. On April 3, 2016, two brand-new steel silos were toppled in Darlington, Wisconsin, closing the nearby road for several days. [iv] Older silos do, however, have a greater likelihood to develop corrosion that can lead to property damage, serious injury and death. Overall, concrete offers numerous advantages and provides better structural stability than steel or aluminum in the construction of storage silos. 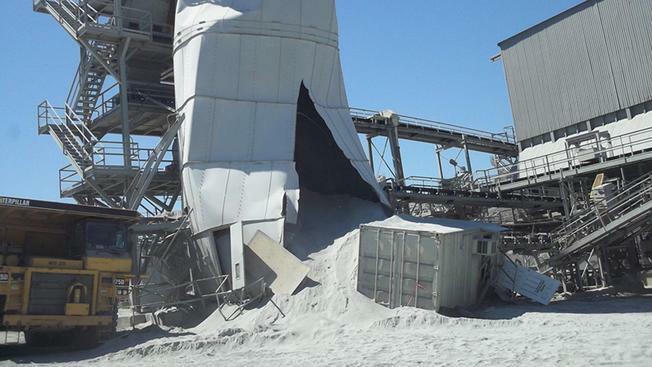 Concrete better resists internal pressure that causes buckling, splitting and other failures of steel silos like abrasive internal wear from stored materials and corrosion. Using concrete in place of steel for the construction of storage silos eliminates these risks when combined with proper maintenance and inspection. Steel structures regularly battle costly corrosion issues and damage from high winds while concrete silos require no exterior painting or cleaning and are not susceptible to rust or collapse from wind. Concrete repair is often far more convenient as it can usually be conducted externally, while repair of steel silos often must be done internally. This leads to costly down-time as silo content must be temporarily relocated. Concrete silos, coupled with proactive silo inspection and maintenance, improve safety and cut product losses. 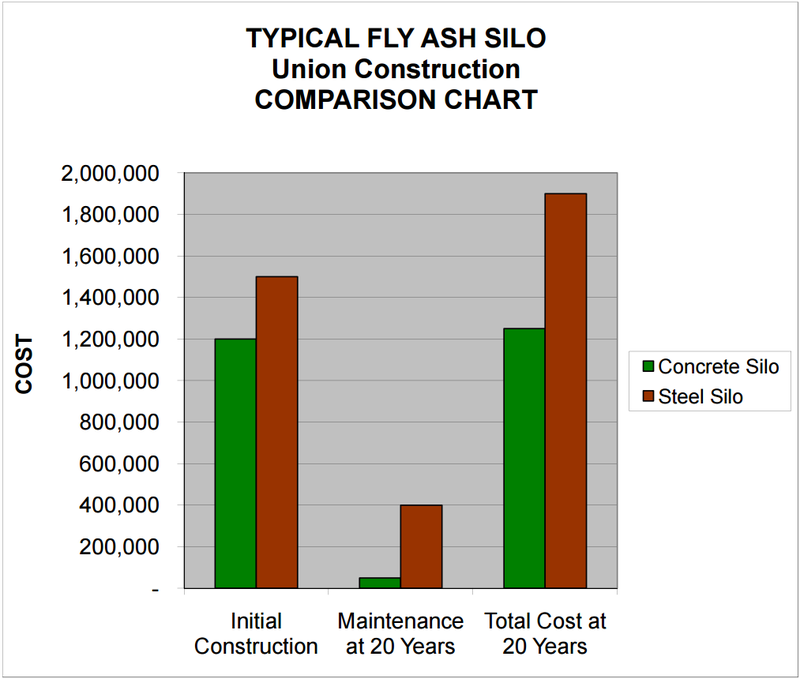 Concrete silos are typically lower in cost than metal silos over their respective lifetimes. [i] Mobley, R. Keith. Plant Engineer's Handbook. 4-19. Boston: Butterworth-Heinemann, 2001. 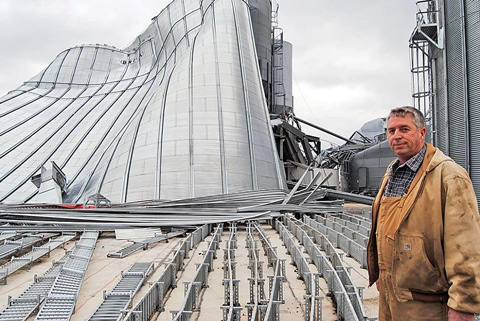 [ii] "Frisco Plans to Tear down Grain Silos after One Collapsed during Tuesday's Storms." Frisco Enterprise, March 10, 2016. Accessed April 14, 2016. [iii] "Hardin County Farm Recovers Following Easter Storm." WFIN, March 28, 2016. Accessed April 14, 2016. [iv] Bolin, Evan. "Silos Toppled, Road Closed in Darlington." WKOW, April 3, 2016. Accessed April 14, 2016. [v] MacFarlane, Scott. "'Corroded' Parts One Reason Silo Collapsed in Loudoun Co., Killing 18-Year-Old: Federal Report." NBC Washington, January 14, 2016. Accessed April 14, 2016.